My last memory of running on both my legs was in the fall of 2001. I had just moved to Rochester, Minnesota with my family and was the new kid in the 5th grade. At recess, my classmates and I would flock to the soccer fields. The grass, freshly mowed and a little damp from the rain, would stick to our legs as we ran up and down, chasing the ball between goals. Being on the field was the great equalizer. I wasn’t just the new kid anymore, I was part of a team. I could just play. That January, I had my leg amputated. Things changed immediately in how I was viewed by my classmates and other adults who were not close to me. Not in a mean-spirited way, it was just the way it was. I was no longer the fast, athletic kid I had always been. I was now a bald and sickly wheelchair bound youngster missing her leg. It would take me years to overcome this new identity that had been thrust upon me at such a young age. For many, this was the first time they had ever met an amputee like me. And for me, I was the only lower extremity amputee I knew. I didn’t know what to expect. Or what I would be capable of. Before I had my surgery, my oncologists set up a meeting between me and another boy who had lost his arm to cancer. I received a great deal of encouragement from meeting him, that I could beat my cancer and live a fulfilled life, but it was hard for me to relate to someone who still had two legs. In the years that followed my amputation, I met only a handful of other amputees. It became clear pretty quickly that my potential would be something I needed to set by myself. Eight months after my amputation, I was back playing soccer with my friends, on a rudimentary leg. I had accepted the fact that insurance wouldn’t pay for a running leg for me, as they had denied me even having a waterproof leg that I could use to play in the water. After a year of medical bills from my chemotherapy, surgery, and hospital visits, my family was wiped out and had little energy to give to fight another insurance battle. The challenge for me, however, was that my leg was not built to keep up with the potential I saw in myself. I was sidelined in gym class time and time again from my foot breaking. One year, I was doing the shuttle run as part of the Presidential Fitness Test. As I was sprinting, my prosthetic foot gave out from underneath me and I heard a big crack. The foot had literally snapped in half. In front of my entire class, I limped over to my gym instructor to tell him I had “broken my foot,” which was met with an extremely puzzled look since I was not in any pain. For the next couple weeks I sat on the sideline during gym class, wanting so badly to play with my friends, as I waited for a new foot to be ordered. I didn’t have a back-up leg and I was told to avoid physical activity until we got it fixed. Looking back, it’s easy to see how various “limits” piled up on me over the years, like bricks being laid with mortar. First, I was told not to play in the water with my leg. Then to avoid physical activity, to take it “lightly” on my prosthetic. To find a different sport other than running because it was too hard on my leg. People questioned whether I could do certain things, and offered to do them for me. After awhile, these limits weighed on my mind and I started to question myself. I repeated them in other ways, making excuses for why I couldn’t do certain things, even things I had never even tried. But we all have the potential to truly break free. From limiting views, from limiting beliefs. Intangible boundaries that keep us from achieving our greatest potential. After 1,500 miles down the coast, I had finally started the healing process, tearing down brick-by-brick, the wall of limitations that had been built in my mind over 16 years. 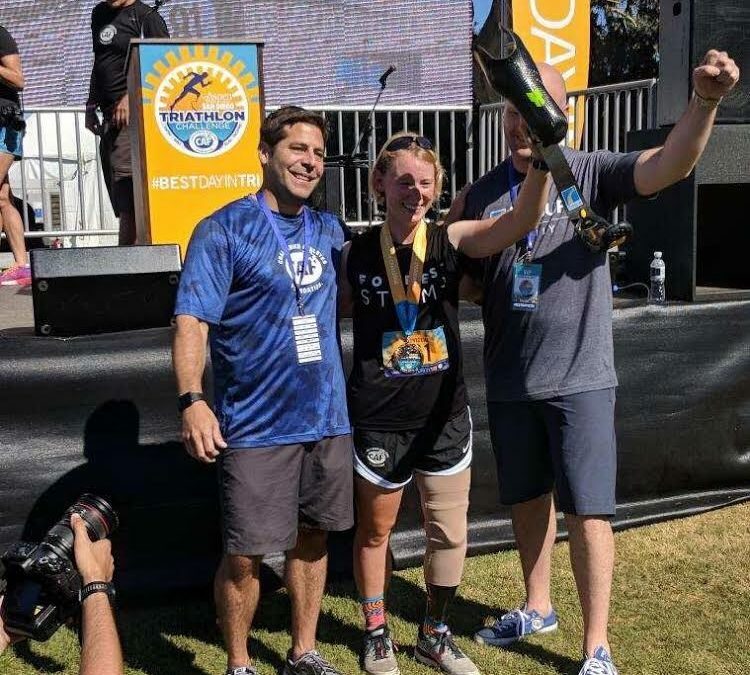 Little did I know, as I walked on stage in San Diego at the Challenged Athletes Foundation’s Triathlon Challenge, my wall would finally break free. My journey down the coast had been about using my voice, my story, to lift up countless others like me who have had biased limitations set on them over the years. Who have had to battle insurance and the system in determining what their potential would be in life. Never once had I thought, or expected, that I would receive a gift in return for this mission. To my complete surprise, I was presented my very own running blade by CAF’s generous partners Össur and Microsoft. And Cornerstone Prosthetics and Orthotics in Everett, WA had agreed to donate the time and materials to build the leg. I was completely speechless. As I looked out to my family in the crowd, who had been there every step of the way since my amputation, who had seen my struggles and triumphs over the years, the floodgates broke free and the tears rolled through. I was stunned at this amazing generosity and for these partners in believing in me as an athlete, a human being capable of transcending any physical limitations. Having access to this technology is a game changer in what I can accomplish. More than that, it’s a belief in my own human potential to rise above my condition and beat what people consider a disability. This is truly the greatest gift to be given. A human right that should not be denied by insurance solely for the sake of a profit. Simply, the gift of running. Watch the video below for the presentation of Nicole’s running blade.